A tattoo artist became a hero for online social networkers overnight after he risked his life on to rescue a tiny kitten in the middle of the road on the Taksin Bridge on Wednesday. The video clip of the rescue from a dashboard camera attached to his helmet was viewed over 965,900 times in about 20 hours after the man posted it on his Facebook wall at 4pm on Wednesday. The man, whose Facebook account is titled as “Un, No-name Tattoo Artist”, recounted on his post that it was raining and his motorcycle had a problem with the accelerator cable when he encountered the poor kitten in the middle of the road. The clip showed the man parking his motorcycle and rushing out to pick up the kitten in front of a pickup truck that stopped. 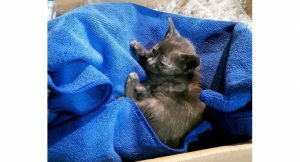 The man recounted in the post that he took the kitten to the Kawasaki service centre where he had his motorcycle fixed and someone had adopted the kitten. A lot of Facebook users thanked the man in their posts. The main post with two video clips and the photo of the rescued kitten in a box at the Kawasaki centre was shared over 4,900 times and received over 13,000 “likes”.